Collard us impressed with this week’s Featured Onepager! Bernie’s Southern Bistro has been serving up good food, good drinks, and good times to the residents of Portland, OR since 1998. If you want to be cozy, warm, and trust that you’re about to be well fed, just like you would at Grandma’s house, then look no further than this rouge gem. A Southern Bistro should feel like home, and that’s exactly how it feels to land on this week’s featured Onepager. 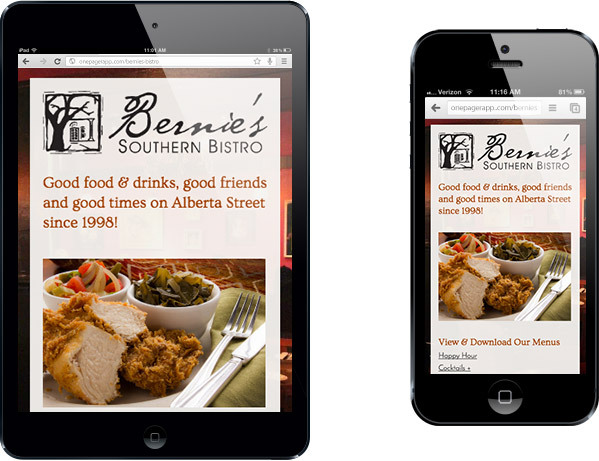 Bernie’s Southern Bistro cuts right to the chase on their Onepager, and lets the viewer get up close and personal with what they’re serving up to their customers! Golden fried chicken, collard greens, and mixed vegetables are front in center, just below their header that reads like the motto of your favorite Uncle. Hover over the photo, and you’ll see that you can click through other fan favorites like hush puppies, shrimp and grits, and the Bernie’s Sidecar. They have included quick links so you can easily download and view their menu of Southern specialty dishes, cocktails, and desserts that are sure to make you question if the owners are actually from Oregon. 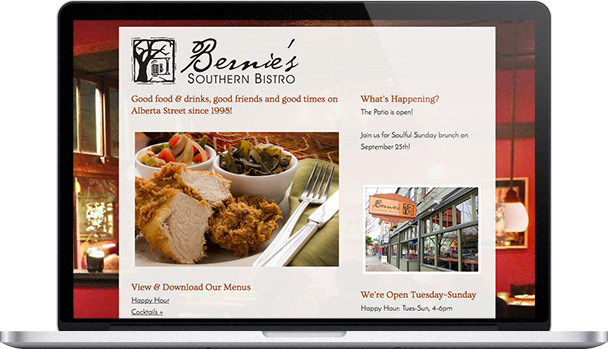 Although the last day of service at Bernie’s Southern Bistro was October 7th, the owners have their phone number posted, or you can message them directly through their Onepager, so if you’re looking for event catering from the team that brought you this Portland staple, you know exactly how to reach them. They have also connected their social media toward the bottom of the page, as an alternative to get in touch, and stay in the loop on what they’ll be serving up next! Congratulations, Bernie’s Bistro, on a site with soul!